When Hidekazu Tojo emigrated from Japan to Vancouver in 1971, sushi was not on the menu. Most people didn't eat raw fish and thought seaweed belonged in the ocean. In 1974, determined to make sushi appealing to the locals, the chef opted for more palatable fillers, such as cooked crabmeat and avocado. To conceal the offending dried seaweed, he rolled the sushi so the rice was on the outside. Calling it the Inside-Out Roll. Tojo's creation became a great success and was eventually dubbed the "California roll." 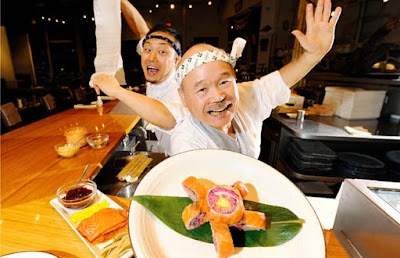 Tojo is still working as a chef and owns his own restaurant, Tojo's, in downtown Vancouver.